At Boring Business Systems we take recycling and sustainability seriously. In our industry, a large amount of waste can accumulate, mostly in the form of toner cartridges and paper products. Reducing waste matter to our clients, as well, but they sometimes need help to achieve their environmental goals. Boring’s Managed Print Services (MPS) help businesses reduce the amount of waste their employees produce in the scanning and printing process. By optimizing a business’s print fleet to best serve the company’s needs, we can decrease toner usage without affecting print or color quality. When the toner cartridges in a printer are low the machine will flash a warning light even though there is still about 15% of usable toner left in the cartridge. This creates unnecessary waste and costs. Boring’s MPS will lower that percentage to around 5% before any warning lights appear giving our clients double the benefits by reducing costs and producing less waste. 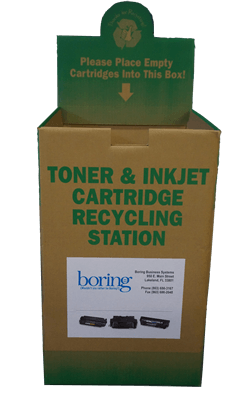 Recycling Boring Business SystemsBoring Toner Recycling StationRecycling toner cartridges is another vital piece of Boring’s environmental services. When your toner is empty Boring will pick up your used cartridges as well as other waste materials and recycle them through a safe and effective process. 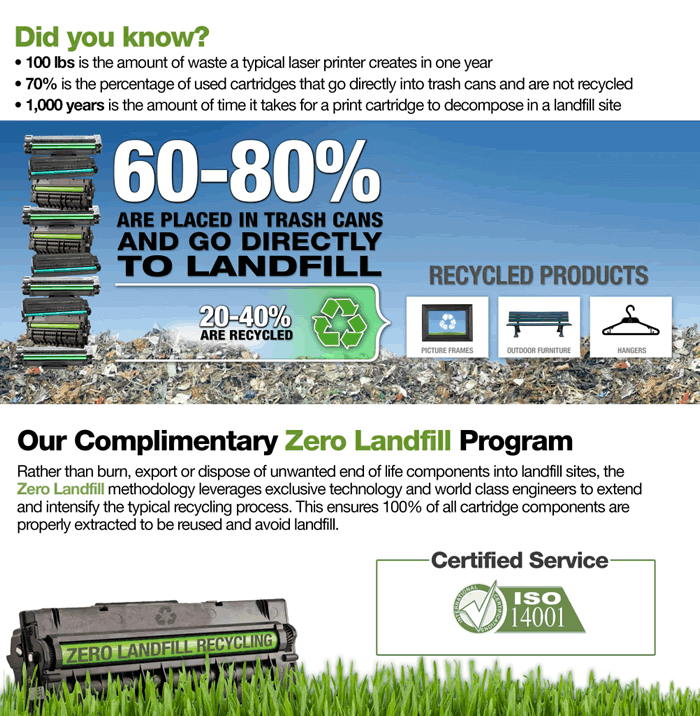 We participate in LMI Solutions’ “Zero-Landfill” program which allows us to ship used cartridges directly to a manufacturing center that recycles all reusable material. LMI also has a carbon offset program that plants trees to replace the resources used in packing and shipping. In addition, all boxes and packaging materials provided by LMI are made of recyclable materials. After the recycling process is complete, LMI produces re-manufactured toner cartridges which Boring purchases and distributes to our customers. Materials that cannot be recycled into cartridges are utilized in other ways, to create goods such as coat hangers, park benches and picture frames that are sold to national retailers. Worldwide, 70% of all toner and ink cartridges used by businesses are thrown away and end up in landfills. A typical laser printer will create up to 100lbs of waste a year after packaging, creation of products and operating materials. Thanks to carbon dating it has been calculated that if not recycled properly, a toner cartridge can last up to 1000 years in a landfill. Our recycling partner, LMI Solutions is certified by ISO 14001 and R2 and undergoes regular inspections to maintain their accreditation standards. This certifies that all waste products are properly recycled and/or reused by LMI, keeping toner cartridges out of landfills for good. Want a toner recycling box for your office? Contact us to learn more.